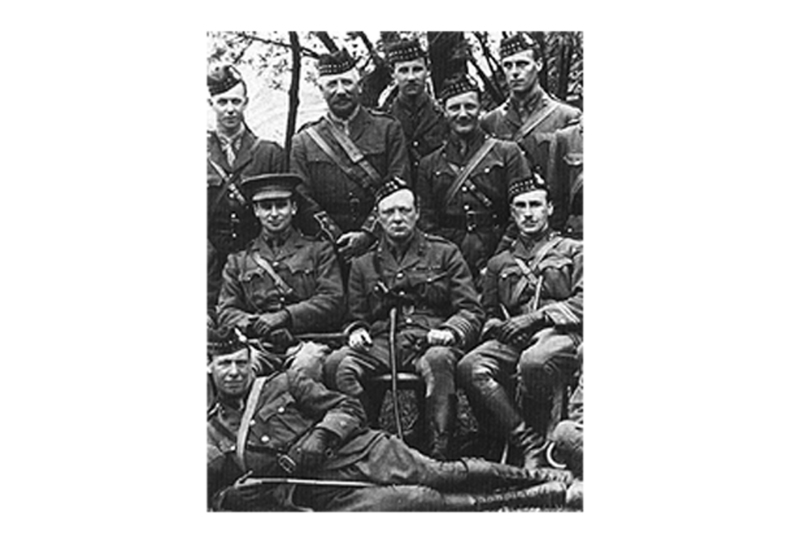 Public image: Winston Churchill,1916, with the Royal Scots Fusiliers at Ploegsteert on the French-Belgian border. The centenary year of the outbreak of the First World War has encouraged a variety of reflections. To previous generations, the role played by their prime ministers would have been amongst the first items worthy of comment. In a less hierarchical age priorities have changed: but prime ministerial responses to the Great War are, in fact, crucial to how we remember today in some quite unexpected ways. For each of the 23 years between May 1940 and October 1963 men who had fought in the First World War held the office of Prime Minister. By contrast, Second World War veterans held the office for a mere seven years. Four British Prime Ministers saw active service in the Great War: Winston Churchill, Clement Attlee, Anthony Eden and Harold Macmillan. Churchill’s road to the front was unique: he began the War in the Cabinet; after he resigned in the wake of the disastrous Gallipoli campaign, he wangled his way into the command of a battalion of the Royal Scots Fusiliers in 1916; he returned to senior political office in 1917. Attlee, Macmillan and Eden were part of the more conventional ‘Great War generation’, men on who fell the burden of frontline fighting. All three volunteered. All three served as infantry officers, Attlee with the East Lancashire Regiment, Eden with the King’s Royal Rifle Corps, and Harold Macmillan with the Grenadier Guards. War would later force the four men to work together. In May 1940 Churchill formed his wartime coalition government: Attlee entered the War Cabinet and, in February 1942, became Deputy Prime Minister. Eden became Foreign Secretary in December 1940. Macmillan entered the Cabinet as British Minister Resident in the Mediterranean at the end of 1942. Their co-habitation lasted until Attlee broke up the coalition following the defeat of Germany in May 1945. They were the ‘regulars’ who emerged from the War with their faith in British society, British institutions, British people, not only intact but also strengthened. ‘My war ended one June day in 1919,’ Eden wrote, ‘and I emerged tempered by my experience, but with my illusions intact, neither shattered nor cynical.’ They did not fit Sigmund Neumann’s inter-war characterisation of the ‘great war generation’ as ‘irregulars’, articulate, maladjusted, war veterans attracted to extremist politics. Hitler in Germany, and his pale English shadow, Oswald Mosley, celebrated the War for destroying the link between classes and generations. The regulars, on the other hand, deliberately pushed solidarity into the foreground. Successful British politicians mythologized the volunteers of 1914 and 1915 as the epitome of a virile nation. The volunteer army of Loos and Gallipoli loomed more important than the conscript army of Passchendaele. But they did not overstate their case. Politicians of the Great War generation were happy to go by their military ranks, Major Attlee, Major Eden, Captain Macmillan, on the campaign trail. However, by-elections at the very start of their careers had demonstrated the practical limits of such rhetoric. In March 1921, for instance, there had been a straightforward ‘war hero’ election in East Woolwich: Captain Robert Gee, VC defeated the future Labour Prime Minister, Ramsay MacDonald. MacDonald’s anti-war stance had forced him to resign as Chairman of the Labour Party and had exposed him to sustained vilification. Gee, despite his rank and decorations, was far from being ‘one of us’: he had completed a 22 year term in the Army as a private before the War. His commission was won for battlefield bravery. He was the member of a right-wing working class organization. As a political tactic the fetishization of heroic war service was likely to benefit the ‘irregulars’ not the ‘regulars’. Only rarely, and in private, did the veterans allow themselves to snipe at non-combatants like Attlee’s successor, Hugh Gaitskell, whom Macmillan described in his diary as a ‘contemptible creature – a cold-blooded, Wykehamist intellectual and embusqué’. The most successful memorial of the era was not a prime ministerial memoir but a stage musical. Whilst Harold Macmillan was still Prime Minister, in March 1963, Oh! What a Lovely War opened at the Theatre Royal Stratford East. It soon transferred to the West End; Richard Attenborough’s film version was released in 1969. Lovely War’s originality was to take first-hand accounts and combine them with contemporary songs. The jaunty tone of the songs clashed shockingly with the underlying tale of millions slaughtered as the dupes in a class war. One early scene set during the battle of Loos in 1915 – the battle in which Harold Macmillan first saw combat – transmogrified the story of the war from one of national virtue that Macmillan, Eden and Attlee preferred to tell, into a condemnation of the privately educated elite that they represented. The politicians had been hoist upon their own petard. Those who admired them, as well as those who execrated them, did so, because they appeared true to Owen’s creed. The Great War Prime Ministers did have acquaintances whose zest had been destroyed by the War: but they themselves were exactly the ambitious, hard-working, pragmatic, types who were always attracted to politics. For them the War was the ‘good war’ that confirmed them in their course. By the fiftieth anniversary of the outbreak of the First World War, it was becoming natural to judge politicians against the yardstick of poets and artists. Only those who expressed similar sentiments had a legitimate voice. This trend has only intensified over the past fifty years. It is important to remember the actual experience and thoughts of those who reached the premiership rather than to ascribe views and feelings that did not exist. Copyright Simon Ball. This article was produced as part of the No10 Guest Historian series, coordinated by History & Policy. Learn how UK government is marking the First World War Centenary.